A cosmetic or plastic surgeon will generally perform a rhinoplasty procedure, or nose job, to change the shape or size of the nose. 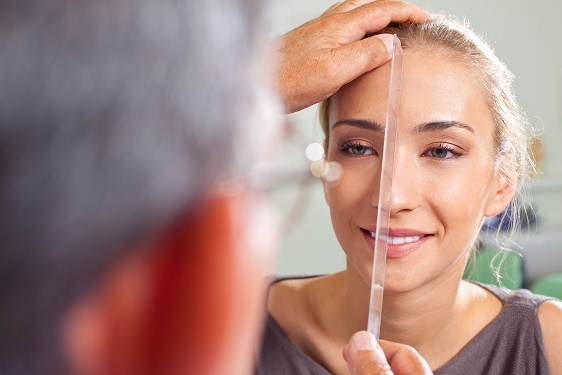 A surgeon can remove bone, cartilage and skin tissue to reduce the width and length of the nose. Rhinoplasties for cosmetic purposes are meant for adults after the nose has stopped growing. Patients requesting rhinoplasties have interior or exterior abnormalities of the nose in some cases. Deviated septums or unusual bumps are examples of these abnormalities. Despite some patients already having an attractive nose, they may want to make it more aesthetically pleasing because of personal preference. Many individuals in the entertainment industry want to look attractive while on stage or in movies, leading to getting a nose job or rhinoplasty procedure. Some of the celebrities who have had nose job procedures include singers, actors and models who desire a perfect nose. Celebrities do not always admit that a rhinoplasty procedure was to make their nose more attractive. Instead, they will state that they need the procedure to repair a deviated septum or other abnormality. Nose reshaping is a common cosmetic procedure received by Hollywood celebrities. Some celebrities, such as actress Jennifer Grey, are very open about having plastic surgery. However, there are others who want to keep the procedures private. While it might seem like celebrities only get rhinoplasties because of the way they look, there are other reasons for it. An example is that athletes have been known to get nose jobs because of sporting injuries. These injuries may require extensive repair. During this surgery to repair the nose, a surgeon can adjust its shape and size at the same time. Accidents or nasal abnormalities have caused other celebrities to require nose jobs. Many people think that only the rich and famous can and should get rhinoplasty procedures done. Even though it seems that way, the truth is that they may actually be more common, affordable, and necessary than you might think!